An exciting adventure mystery set in the cut-throat world of Elizabethan England. After a varied career, John Pilkington began writing radio plays in the 1980’s, followed by theatre plays, television scripts for the BBC and a non-fiction book, before writing Rogues’ Gold, his first children’s book. When boy actor Ben Button’s fellow players are accused of stealing the priceless Lodovico plate, he sets out to save them from the shadow of the hangman’s noose. Who really stole the plate, what secret does it hide and how can Ben reveal the truth? The hardest thing Ben Button had to do that morning, was say goodbye to Brutus. Ben climbed up onto the cart, and sat beside his master, John Symes, on the driver’s bench. He had already said goodbye to John’s wife and daughters. They understood that John, Ben and the rest of the company would only be away for the summer. But Brutus was a dog, who didn’t understand it at all. Brutus stood outside the Symes’s house, on the corner of Hog Lane, his tail and ears drooping sadly. John shook the reins, and the cart began to move off. Brutus watched it roll away down Bishopsgate Street towards the city. Ben was excited about going on tour for the first time, but the thought of leaving Brutus brought a huge lump to his throat. The old hound had been his friend since he’d first come to live at the Symes’s house last winter. To leave him behind was almost more than Ben could bear. He bit his lip. Soon they would pass under the stone arch of Bishopsgate and enter the city, and the house would be lost to sight… Ben looked back, and his heart thumped. Brutus was still there in the distance, watching the cart disappear. Before he knew what he was doing, Ben raised his hand and waved. And it seemed to him that the dog lifted his head, as if to show that he understood and didn’t blame Ben too much after all. Feeling a little better, Ben turned and stared ahead at the horse’s back. Ben Button was a boy actor. He had been apprenticed to his master John Symes six months ago soon after his twelfth birthday. John was a fine character actor, and the chief musician of Lord Bonner’s Men, who considered themselves the best acting company in London. To Ben, John was like a father: the father he no longer had, since Peter Button had died three summers ago, leaving Ben’s mother struggling to bring up her three young children alone. Then, one day, John spotted Ben singing and dancing at a village summer fair. He knew at once that Ben’s future lay with the stage, and Ben’s mother agreed to an apprenticeship. Since then Ben had become close to John, as he had to all the actors of Lord Bonner’s Men. They were like family now, and he wondered for a moment when he would see his real family – his mother, brother and sister – again. Lord Bonner’s troupe usually performed in any one of the open-air theatres that stood outside the city walls, north and south of the River Thames. But now with the summer coming on, everything had changed: the theatres were closed, and the acting companies had to look elsewhere for work, so Lord Bonner’s Men were leaving London and going on tour. They were heading south, into Surrey. Ben had never been so far away in his life. It scared him a little – but it excited him, too. The cart rattled on the cobbles as they rolled under Bishopsgate. Although it was still early morning, with the sun just beginning to climb above the rooftops, there were a lot of people about: carters and peddlers coming in to sell their wares, servants and housewives with covered baskets hurrying to the markets to buy. Ben, who came from the sleepy village of Hornsey a few miles north of London, where his father had been the blacksmith, always found the city a noisy, crowded place. And in the theatres, the crowds were at their noisiest and rowdiest: a mass of laughing, shouting, disorderly people. The first time he had stepped onto a stage, Ben had been terrified. He thought of it as they passed by the Cross Keys Inn in Gracious Street, which had a stage in the yard where the company sometimes performed. But now that he was a seasoned performer, Ben could smile about it. The theatre was his life, and he wanted no other. To his left he could see the Tower of London, looming above the houses. He glanced at John, who was holding the reins and had said nothing since they left the house. John turned to him with a kindly look. Ben nodded. The noise of the city filled his ears, as they rattled down Fish Street Hill. He saw the huge bulk of London Bridge ahead. Emerging from the southern end of the great stone bridge, John drove the cart past the church of St. Mary Overies and halted. Here on Southwark shore the houses soon gave way to fields. The countryside of Surrey stretched away southwards. There was a shout. A group of garishly dressed men stood some yards away, surrounded by a heap of baggage: chests of costumes and props, bundles of curtains and bits of scenery. A smile spread across Ben’s face. The four actors waiting by the roadside made up the remainder of Lord Bonner’s touring company. Excited, he clambered down from the cart to greet the first of them, a grinning, handsome man with long auburn hair, who stepped forward, picked Ben up and lifted him into the air. “Hey, put me down!” Ben shouted, though he was laughing. Ben helped with the loading as the company gathered about the cart. He struggled to lift a chest, and was frowned at by the oldest of the men, grumpy Will Sanders. Will was their jack of all trades: cook, prompter and supporting player, who took any parts that needed filling, from servants and soldiers to old men. Some said he looked better in a gown and a long grey wig than he did in his normal clothes. Ben turned to find himself looking into the gloomy face of Solomon Tree, the tall, spindle-thin actor who specialized in comic roles. The first time he heard that, Ben thought the company were having a joke with him. Later on, he came to know better. Onstage, Solomon was a hoot; off it, however, he was hard work – that is, until Ben found a way to deal with him. “Why is it doomed, Sol?” he asked in an innocent tone. “I hope not,” Ben answered gravely. “Otherwise I don’t know what might happen.” Over Solomon’s shoulder he saw the others watching, trying not to laugh. Solomon was looking quite worried now. “What sort of doom do they bring?” he asked. There was a snort of laughter. Solomon looked round to see the others grinning, and understood. “It was too easy.” The last member of the company interrupted, putting a hand on Solomon’s shoulder. He was a little, nervous man called Gabriel Tucker, who specialized in villain’s roles. Ben had found it harder to get used to Gabriel than any of the others – especially the way his nervousness suddenly disappeared the moment he buckled on a sword or dagger. Ben shook his head. “I couldn’t do what you do,” he began, then yelped. Solomon had yanked him off his feet and was holding him upside down. “I’ll remember,” Ben said as he scrambled nimbly to his feet. But he was already grinning to himself. It wouldn’t be long before he thought up another trick to play on Solomon. The loading completed, they stepped into the roadway, while Will Sanders climbed onto the cart to take his turn at driving. He shook the reins and began to ease the carthorse forward. The old, chestnut-coloured horse was named Tarlton after a famous comedian who had died a few years before. It was another of the players’ little jokes. The Surrey countryside rolled by all day, in the warm haze of early summer. Through woods, fields and small villages – Streatham, Tooting, Malden – Lord Bonner’s Men tramped the dusty road, heading south-west towards the Downlands. The actors walked in front, while the cart brought up the rear. With only brief rest stops to take some bread and ale, and to feed and water Tarlton, they covered twenty miles, which seemed to Ben a huge distance. By evening London was far behind. As the shadows lengthened the players splashed through a small stream, climbed a hill and halted, all of them footsore and weary. Ben was sitting on the cart beside Will, falling asleep, when John’s voice from ahead made him open his eyes. Ben sat up and peered forward. In the distance he could make out a large stone house surrounded by outbuildings. Closer to, he could see horses in a fenced paddock. He knew Bowford Manor was the first stop on their tour – their patron Lord Bonner had arranged it. Though after that, the company would have to take their chances at the towns and villages along the way. Some would make them welcome, while others might not. It was a precarious sort of life, being a player. Hugh looked back towards the cart with a grin. “How does supper and a soft bed sound?” he asked cheerfully. The others brightened, and set off down the slope towards the welcoming sight. Wide awake now, Ben turned to Will, who sat hunched over the reins. “Who’s the master of Bowford Manor?” he asked. Ben was quiet. Talk of Queen Elizabeth’s court always bored him. Though he had caught glimpses of the Queen several times in her royal barge on the River Thames, he had never seen her close up. He knew, as most people did, that she was a gifted and clever woman, who had many suitors but had never married. Like her father, King Henry VIII, she loved music, sports and dancing, and she spoke several languages. She also loved the theatre, and Lord Bonner’s men had hopes that soon they would be called to entertain at one of her palaces. But apart from talk of the Queen herself, Ben seldom understood the gossip he overheard in theatres. It was usually about politics: who was in favour at court and who was not. He heard it mainly from the richly dressed gentlemen who sometimes sat on the stage, scoffing at the actors. Fetching stools for such people was the only part of his work Ben truly disliked. He hoped Sir James Howard’s household was not like that. Ben was about to ask Will another question, when from somewhere to the right came the blast of a hunting horn. The players stopped in surprise as a large deer crashed through the bushes, skidded into the road and veered away up the slope from where they had come. As it disappeared over the ridge, two riders appeared on sweating horses, in hot pursuit. But seeing the startled troupe of travellers and their cart in the way, the pair drew rein and halted. The first was a bulky man with a black beard, wearing fine hunting clothes of dark brown and a feathered hat. Ben’s eyes widened: surely this was a knight or earl – perhaps Sir James Howard himself? The big roan horse with its tooled harness suggested a man of wealth and status. As if to confirm this, the rider spoke up in a loud voice – which was far from friendly. He sat his horse and stared at the players in their bright clothes. Hugh Cotton wore a duck-green doublet with the sleeves slashed to show the yellow silk lining, whereas John Symes favoured sky blue and a cocked hat to match. Gabriel’s bright red cloak was slung over his shoulder and Solomon wore his customary red and yellow comedian’s suit, next to which Ben’s maroon doublet and baggy breeches appeared quite plain. Only Will, in his shirtsleeves, looked ordinary. At that, his companion eased his horse forward. He was an older man in plainer clothes, who took off his hunting cap to reveal a shining bald head. He looked down at John and the others and smiled. But to Ben it seemed an odd sort of smile; neither warm nor friendly. Lord Bonner’s men began to relax. Players like them were always at risk on the road, which is why they had to have papers from a nobleman proving that they were authorized to travel and provide entertainment. Otherwise they could be arrested as rogues and vagabonds and thrown into jail, or even worse. He turned to his companion, who was growing impatient. “Sir Ralph,” he began, but the haughty man tugged hard at the rein, making his horse jerk its head in alarm. Ben found himself disliking this noble personage more by the minute. And with that he dug his heels into the horse’s flanks and galloped away. In a moment he had ridden over the crest of the hill and out of sight. The players nodded, and began the last part of their journey. But as Will started Tarlton forward, Ben found his eyes resting upon the bald-headed steward ahead of them. Ben wasn’t quite sure why, but he disliked Master Bullen, even more than the angry-looking Sir Ralph. Then he decided it must be the man’s smile: it reminded him of the grinning jaws of a hunting dog, before it stoops for the kill. John Pilkington worked at various jobs – in a factory, in offices, in a research laboratory, on a farm, and as a rock guitarist in several bands – before realizing he wanted to write. He took a degree in Drama and English, acted and directed in a theatre company touring schools, and then began his professional writing career with radio plays in the 1980s. He has since written plays for the theatre and television scripts for the BBC. He is also the author of a series of historical crime novels, and a non-fiction book, "A Survival Guide for Writers". 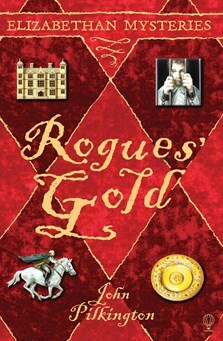 "Rogues’ Gold" is his first children’s book. Visit the author’s website, www.johnpilkington.co.uk/, for more information. Boy actor Ben Button sets out to save his fellow players from the shadow of the hangman's noose in a mystery adventure story that will entice readers with its colourful characters and authentic historical setting. With the Tudors being a focus of the KS2 history curriculum it is always a pleasure to find stories which provide good solid historical facts whilst maintaining their integrity as a well written piece of fiction. This story is a rip-roaring adventure story with the young hero very much the centre of events. Whilst visiting Bowford Manor he and the rest of the 'Players' that he belongs to are caught up in the remnants of the plot to kill Elizabeth I and replace her with Mary, Queen of Scots; even though this is set well after the execution of Mary. The author has managed to blend the adventure with a feeling of accuracy in his background and particularly in the differentiation between the rich and poor; he is a worthy successor to the likes of Cynthia Harnett and Rosemary Sutcliff who were so central to my own love of history.